Starting out the New Year with major surgeries behind me triggers a new chapter in my life, entitled “a new sense of normal.” My hemotologist, Doc Nelson, took me off Cumadin last month since I’ve gone 5 years without another blood clot. Unexpected freedom! Upon hearing the news, I rushed out to the grocery store and purchased salad fixings, grapefruit, cranberries, and fresh veggies. Five years of an imposed food desert from items that counteracted my “blood thinner” is over. Since some pounds have crept on the past five years (try dieting when you can’t have much of said items), I decided to try Weight Watchers in an effort to get back to my fighting weight from college. My husband Steve is joining me on our improved nutrition journey and we are now on week three of new healthy eating habits. The new points plus program is easy to follow and provides a great foundation for slow and steady weight loss and a constant reminder of portion size. Our “super size me” economy has distorted our sense of what is the appropriate size. And no, this is not a commercial for Weight Watchers, but it is a testimony for all of us to wake up and look at your plate and see what you are shoveling in your yapper. I’m back in the gym and have tried two new group exercise classes to earn “activity points,” which allow you to eat more (if you want to) or lose more weight. The first class, “Butts and Guts” is taught by the gym owner, Chris. It is one full hour of exercises meant to torture a 50-year-old, out of shape female body. Starting with jumping rope, followed by, “drop down and give me 50 pushups”, burpees, sit ups, jumping jacks and so many more. I had a flash back of the song “Chicken fat” from my childhood. “Give that chicken fat back to the chicken and don’t be chicken again…” The next day walking was a challenge and the following day I had to take the stairs backwards because my quads were so sore. By Saturday I was good to go for my first Zumba class – which made me feel like a fun loving klutzy middle aged woman. I did have a good time, so will be back for that class. I went back to Butts and Guts on week two and did a bit better and wasn’t so sore, so I guess I’m making progress! That and weight is down 8 pounds in two weeks. It’s amazing what a few weeks of eating well, watching portion size, and working out can do to help you feel better and raise your self esteem too. Thus, the new normal is settling in and I’m looking forward to this new state of me. If I can look past the “normal” head cold I developed last week, things seem to be looking up. Just where I want to be right now. The photo above is of me and my dog friend, Riley. 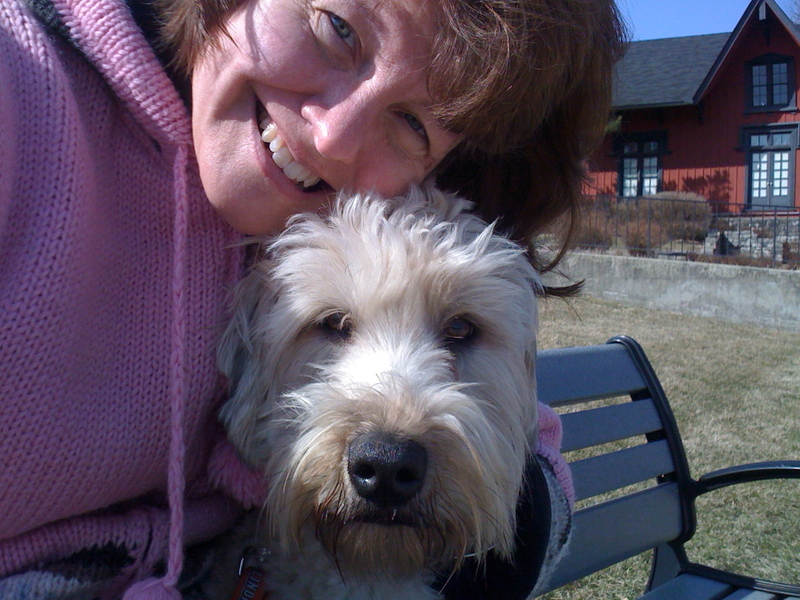 Auntie Britta dog sits every once in a while and we are seen here at Batavia’s Depot Pond. Congratulations on the renewed menu options and the healthy living pattern! I’m so glad someone else knows the chicken fat record. It is amazing; the first few times I tried it in high school I couldn’t complete it because a) it’s harder than it seems and b) I was laughing too hard. What a wonderful message and bright attitude. Congrats on the new you and being off Cumidan. Hope I can get as inspired as you to get in shape! Have been thinking about you and thought I’d check in on your blog. Looking good!